The index opened positive and stayed in the green for the entire session and closed just below the psychological level of 7800 at 7787.15, gain of 35.55 points. The broader market was also positive, with 801 advances to 770 declines. Broader range for July series comes at 7500-8000. Call option 7900-8200 added 8.82 lacs huge amount of OI with short covering seen at 7700 and below strike prices. Put option 7800-7300 added 11.02 lacs huge amount of OI with small profit booking seen at 7000 strike prices. 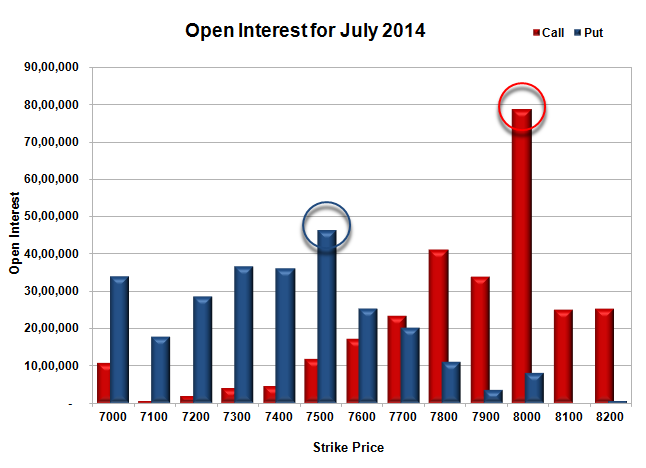 Nifty Open Interest is at 1,43,59,150 up by 83,400, with increase in price, most probably long build-up. 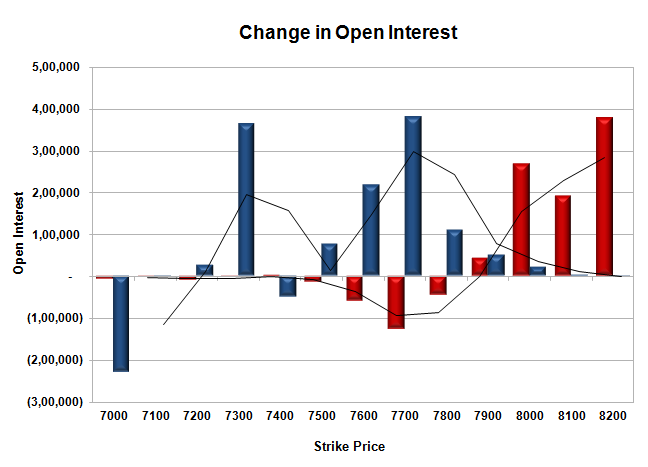 Bank Nifty Open Interest is at 22,67,425 up by 52,875, with decrease in price, most probably huge short build-up. FII’s sold huge 10.92 lacs Futures, which includes 9987 long liquidation and 11849 short addition, with net OI increased by 1862 contracts (includes 28102 longs to 49938 shorts for the day) and the average price per contract comes to around 7784.37. FII’s Index future open contract as on date is 189847 Longs to 120856 Shorts. 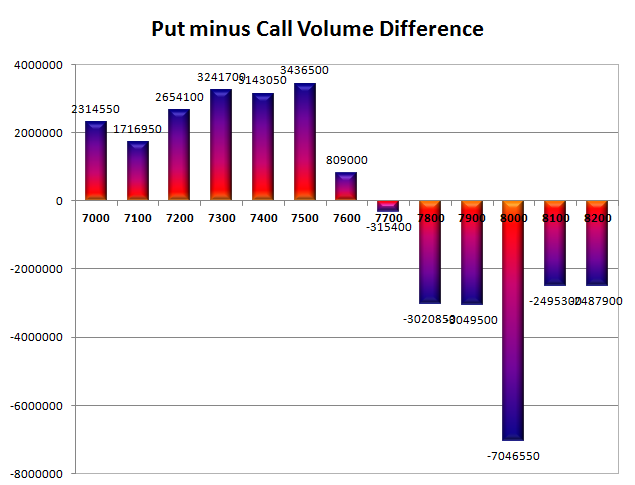 PCR Open Interest (Volume) is near the low point of the series at 0.865. Initial support at 7700, with huge addition for the day at 3.81 lacs and best at 7500 with OI of 46.35 lacs. Initial resistance still at 7800, with OI of 41.22 lacs and best at 8000 with highest OI of 78.77 lacs. Day Range as per Option Table is 7723 - 7835 and as per VIX is 7708 - 7866 with 7778 as the Pivot.